High range pressure sensors, digital test gauges, loggers & calibration pumps for measuring and testing hydraulic equipment. 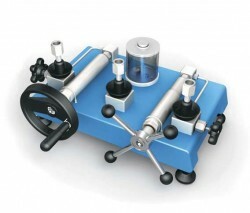 These instruments are used for measuring very high pressures on compressed gas & hydraulic systems. Applications for high range pressure measurement include hydraulic actuators, aerospace flight controls & landing gear test rigs, destructive testing, water cutting machines, construction plant machinery, injection moulding, and oil exploration industry. High range pressure sensing instrumentation for measuring and testing hydraulic equipment. 1000 bar, 15000 psi, 100 MPa Pressure Sensors, Transducers & Transmitters- High range pressure sensors with a measurement range from 0 to 1000 bar, 15,000 psi, or 100 MPa. 700 bar, 10000 psi, 70 MPa Pressure Sensors, Transducers & Transmitters- High range pressure sensors with a measurement range from 0 to 700 bar, 10,000 psi, or 70 MPa. High Range Voltage Output Pressure Transducers- High range voltage output pressure transducers for measuring higher pressures on hydraulic test rigs and control systems with 0-5, 1-5, 0-10 and 1-10 volt output signals. High Pressure Transmitters- High pressure transmitters with 4 to 20 mA current output for measuring hydraulic pressure greater than 100 bar (1500 psi) with a range of accuracies, electrical interfaces and pressure connectors. 600 bar, 9000 psi, 60 MPa Pressure Sensors, Transducers & Transmitters- High pressure range sensors with a measurement range from 0 to 600 bar, 9000 psi, or 60 MPa. 350 bar, 5000 psi, 35 MPa Pressure Sensors, Transducers & Transmitters- High range pressure sensors with a measurement range from 0 to 350 bar, 5,000 psi, or 35 MPa. 1000 bar, 15000 psi, 100 MPa Pressure Gauges, Meters & Manometers- High range pressure gauges with a measurement range from 0 to 1000 bar or 15,000 psi. High Range Pressure Gauges- Pressure gauges for monitoring high range pressure. High range pressure gauges can be used in applications such as hydraulic testing, calibrating high pressure measurement instrumentation and hydraulic presses. Analogue & digital output pressure sensors for measuring high range pressures of liquids or gases. High range pressure transmitters with 2 wire 4 to 20 mA output signals for process control and monitoring of hydraulic system pressures. High pressure amplified output transducers for use on hydraulic test rigs and control systems with 0-5, 1-5, 0-10 and 1-10 volt output signals. High range pressure sensors with strain gauge millivolt outputs for measuring pressures on hydraulic controls and test panels. Hydraulic range pressure sensors with USB, RS232 or RS485 interface electronics. Improve high pressure measurement accuracy with a high resolution computer interface. 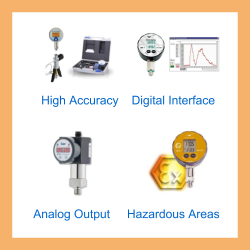 High range digital pressure gauges for monitoring hydraulic processes, high pressure testing and calibrating hydraulic pressure sensors, switches and analogue gages. High range pressure data recorders for saving high pressure readings to create a data record over a specified time period. High range pressure calibrators for checking and testing the accuracy performance of high pressure measurement instrumentation. Measuring high range pressure is typically required when working with hydraulic systems that generate large loads and forces, such as cranes, lifts, construction equipment, and structural test machines. On hydraulic systems the pressure is often in the order of a few hundred (x100) bars or a few thousand (x1000) psi. Hydraulic pressures can be highly destructive to sensitive components such as measurement instrumentation, and therefore these devices have a very robust mechanical design to withstand the rapid rise and fall of very high pressures over many cycles. It is also possible to measure pneumatic systems with very high pressures. In some ways pneumatic systems are less destructive than hydraulic systems because there is no fluid movement to create a hammer effect, however the safety risks are a greater concern, because of the risk of escaping high pressure gas which is capable of propelling objects to a high velocity. Pressure units which are used to describe high pressure ranges include bar (bar), megapascals (MPa) or pounds force per square inch (psi, lbf/in2), or kilopounds force per square inch (kpsi, ksi). 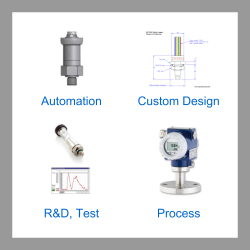 Articles with more information on high range pressure measurement products & applications. Send us your enquiry for a product associated with this High Pressure Range page, and get assistance with selecting a product for your application.